Who hasn't dreamt of flying? 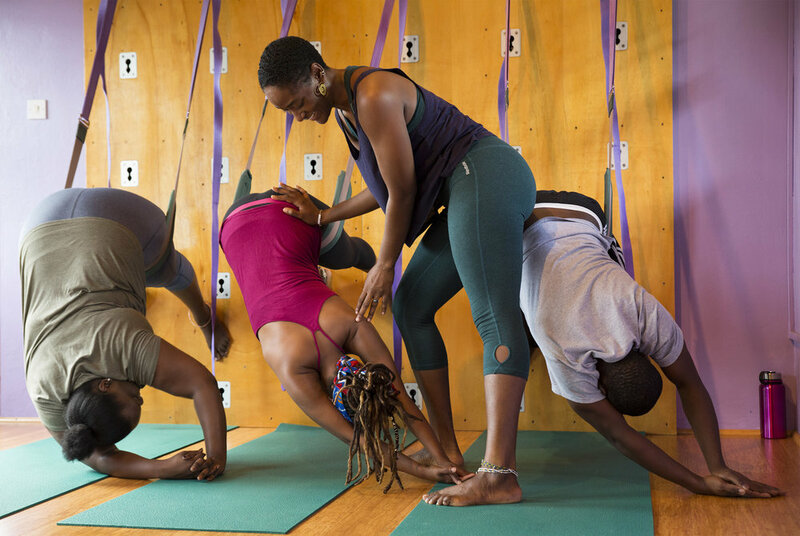 We are truly honored to offer you classes that incorporate the Caribbean's only Great Yoga Wall™. The principle behind the Yoga Wall has been around for decades, originally designed by BKS Iyengar in the form of ropes attached to wall hooks to assist students in various yoga asana (poses). Aadil Palkhivala Yoga Master and co-founder of Purna Yoga, the tradition that our own instructor Kecia is trained in, was one of the early adopters of The Great Yoga Wall ™. The Great Yoga Wall ™ is a newer version of this wall with a system of adjustable straps and more comfortable pelvic swings to accommodate every unique body type. The new system was designed by Kedric Wolfe in the early 80’s after he injured his foot on one of the older system’s wall hooks. It occurred to him that there must be a “better way” to use the wall with more ease and versatility. He developed the innovative design of the Wall Plates which are the foundation of the patented Yoga Wall system. It is a spring loaded socket that receives the ball of the other components. The plates are superbly crafted to mount flush into a sheet of veneer plywood. There are hundreds of poses that can be practiced with the help of the Yoga Wall system. Can help improve overall flexibility and mobility in the joints and spine. Builds strength in both the large and small muscle groups. Aides in the ability to access various muscle groups in poses they are not yet able to achieve on the mat. Offers many therapeutic benefits helping individuals heal from athletic injuries, arthritis, degenerative disc disease, and Sciatica. Can be used as a work-out tool to aid competitive athletes in cross-training and preparation for competitions. Allows one to do hundreds of poses. Can help students work through fear, build confidence, etc, so that they are able to take what they’ve learned on the Wall, to their mats and into their daily lives. Uses specific postures and positioning, movement and breath, awareness to open the joints, connective tissue and joints. Allows standing postures, forward and back bends, twists and inversions. Helps us feel great after doing yoga, because it is a balanced physical practice designed to open the spine in every direction.